Hey, Winnipeg, see if this statement sounds at all familiar – The NHL’s Edmonton Oilers will not play at Rexall Place, even if it’s renovated, after their current lease expires in 2014. That’s what Oilers’ owner Daryl Katz, and his cronies, told Edmonton city council this week. The Katz Group then denied that there was any implied threat to move the team. (That thud was me falling off my chair, laughing) Ringing any bells, Winnipeg? Have any advice for Edmonton? I bet you do. And I bet you’d be advising Edmonton to do whatever Katz demands, right? Because, if you had done that Winnipeg, and built a new rink in the mid-1990s, you’d still have the Jets. 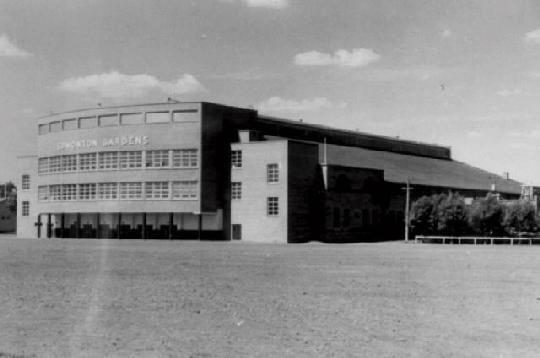 Edmonton Gardens hosted the WHA Oilers for two years from 1972-74. When it was built, in 1913, it was Edmonton's first indoor hockey arena. We can all understand that, over time, NHL arenas go from brand-spankin’ new to obsolete. These days, that seems to take takes about thirty years. 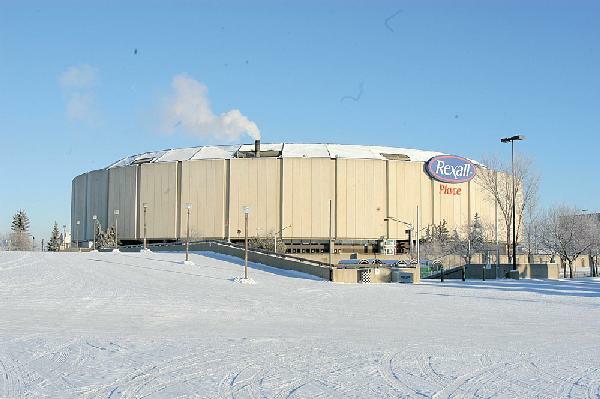 Edmonton’s Rexall Place is the third-oldest rink in the NHL behind Madison Square Garden (first NHL game on 18 February 1968) and Nassau Coliseum on Long Island (7 October 1972). Rexall Place began its existence by hosting the World Hockey Association Oilers in 1974. But its useful life, in today’s NHL, appears to be reaching an end. And that’s where the problems start. Everyone agrees that Edmonton needs a new arena. But the amount of pull that the Oilers have/should have to achieve that is the subject of intense feelings. Currently, the Oilers’ revenue is limited because non-profit Northlands group owns the arena and its concessions, parking, etc. But the Oilers say they need to control non-hockey-related revenues in order to exist. Let me get this straight, Mr. Katz. You bought the club, knowing full-well what its financial situation and lease structure was with Northlands – and now you’re b—tching and moaning because you need more revenue streams? That’s called holding a gun to the city’s head. Plain and simple. You bought in, kept the team in Edmonton and are now announcing that, in order for you to keep it here, you need to change the rules of the game. You are holding the city of Edmonton hostage. The very same way then-Jets’ owner Barry Shenkarow did to Winnipeg about a decade-and-a-half ago. Poor Barry complained that, without a brand-new rink in Winnipeg (which they, ironically, now have), he couldn’t make enough money and would have to sell the team. Despite countless Winnipeg council meetings and lots of public input, the new rink didn’t happen then. And old Barry sold their Jets right out from under the fine people of the Manitoba capital. Disgusting. Edmonton is not going to go down in history as the most progressive city in the history of Canada. Downtown pretty much looks the same as it did thirty years ago. But, here’s some advice Edmonton. Listen to Daryl and his work buddies. Move forward. Figure out a way to work together. It will cost you money. Lots and lots of it. And you won’t have a choice about a lot of things – even though, as city council, you’ll puff your chests out and think you should. 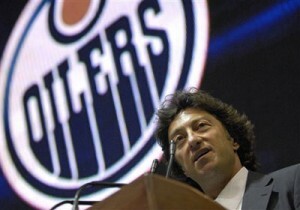 Bottom line is that Edmonton better do what Daryl Katz asks, or they will lose their Oilers. Great article. You point out how Mr. Katz is playing hardball and using the leverage he has whether we -the fans- like it or not. The thought of the team leaving the city seems like an impossiblity, but it’s not. The example of Winnipeg is very appropriate, it all comes down to business and Mr. Katz has shown that he knows how to get what he wants- and why shouldn’t he. Downtown Edmonton would benefit tremendously from having the arena. I used to think/hope teams leaving was an impossibility, too. But the Jets and Quebec Nordiques really brought that into focus. And, two years later, I am still having a terrible time coming to grips with the fact that my beloved Seattle SuperSonics no longer exist. That I still cannot believe. So it sure can happen. I hope Edmonton embraces that notion.